When we think about dental visits, our minds don’t always go to the most pleasant memories. As we age, we may start to think that because we don’t have any oral problems, that means dental visits become less of a priority than when we lived with our parents. Today, your dentist in Danville wants to explain three reasons why you should think otherwise. 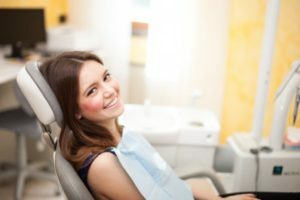 Making routine visits part of your self-care will save you money, save time spent in the dental chair, and prevent unnecessary pain later in life. Regular dental visits are actually the simplest and easiest treatments you can get. They typically take about an hour and are the cheapest treatment you can buy. Furthermore, preventive care also holds the most value when comparing it to any other treatments, including the cost to create restorations, emergency root canal therapy, and periodontal disease treatment. Essentially, every dollar spend on preventive care is worth several more on emergency and restorative treatments simply because of the materials, expertise, and time necessary to complete them. While you may think that you’re saving money in the short-term by only visiting when an emergency occurs, you are most definitely spending more on care in the long-term compared to visiting every six months. This also the case whether you have dental insurance or not. If you don’t like dental cleanings, it’s understandable why you would be doing everything you can to put them off. However, choosing to forgo visits only puts you at higher risk of needing other treatments that won’t be pleasant, particularly after you receive them. For example, root canal therapy and tooth extractions require a certain period of recovery time before you can get back to your daily habits. Additionally, preventive visits can stop a moderately bad dental issue from turning into a serious one, such as gingivitis turning into periodontitis. A simple cavity that only requires a filling could turn into a much larger cavity that needs an entire crown placed. According to your dentist, patients only need to visit him twice a year to meet the ADA’s recommendations. When you skip visits, you only increase the chances that you’ll have to visit more often, not less. For example, patients who are suffering from moderate gum disease will need scaling and root planing to treat. However, this restorative treatment can rarely be completed in a single visit. In fact, it typically takes visits every three months to treat completely. The time you could have spent working or relaxing at home is being used to treat the gum disease that could have been avoided. Don’t let dental visits go by the wayside when there is an answer. Schedule your routine visit today to confirm your oral health status! Dr. Thomas J. White earned his Doctor of Dental Surgery degree from the Virginia Commonwealth University’s School of Dentistry. His many preventive treatments help to catch dental disease in their tracks and help patients maintain proper oral health for years to come. To learn more about his practice, contact him through his website.